Our airwaves, our radio. An independent media is the cornerstone of a truly free and just society. Independent, community-based Low Power FM (LPFM) radio stations are a platform to ensure that the diversity of local voices are heard and the public interest is served. However, because of the structure of our country’s media and federal regulations, community based media has been restricted in recent years. That structure is changing, and FORward Radio has seized the airwaves to strengthen the voice of our community. On April 9, 2017 WFMP-LP began broadcasting 24/7/365 to all of Louisville at 106.5fm and we now live-stream to the world at forwardradio.org. The intent of this station is to democratize the airwaves and amplify the voices of those under-represented in the mainstream media. Join us as a listener, donor, and/or volunteer (behind the microphone or behind the scenes) as we co-create community-sourced and community-relevant media here in Louisville. 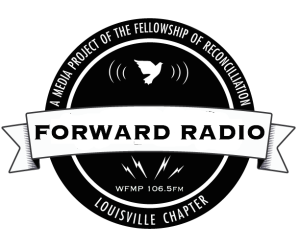 FORward Radio is an entirely volunteer-run, listener-supported community radio station born as a new media project of the Louisville chapter of the Fellowship of Reconciliation (FOR) in pursuit of peace and social justice. Through training and collaboration, FORward Radio seeks to create a network of community partners to aid in building a more diverse and relevant model of media. The station broadcasts diverse local voices that would otherwise continue to be ignored by the mainstream media. We believe that media should serve the public interest rather than private, corporate interests. We believe in speaking truth to power and strengthening democracy through a more informed electorate. While our mission is to “free” the airwaves, doing so is definitely not free. Though we are volunteer-powered, there are a whole host of costs to stay on-air, including licensing, studio and antenna rental, internet services, equipment, and more. We rely on your help and the support of our entire community. Please contribute whatever you can, be it funding, time, talent, energy, and ideas. Volunteers of all talents and abilities are welcome. Donations at all levels are encouraged: Donate online. In addition to individual contributors, we invite non-profits to support the station as COMMUNITY PARTNERS and local businesses to support us as UNDERWRITERS. Both receive regular recognition on-air. You can rest assured that we use every dollar wisely. We run a very tight ship, but basic expenses such as rent, licensing fees, internet and utilities add up. It costs a minimum of $600/month to keep Forward Radio on the air. For just $20, you could fund an entire day’s broadcast! For just $50, you could fund an hour/week for an entire year! If you’d like to send us a check, please make it out to Fellowship of Reconciliation with “Forward Radio” in the Memo line.